d) Extra-Workout Buttery Popcorn ? I devoured it Extra-Extra fast. Just a higher butter ratio to popcorn. I don't add too much butter because I still want my popcorn to crunch. You know it's really hard to ruin popcorn with extra butter. Just make sure you have extra napkins with that. Did you use real butter and did you melt it properly before you applied it? It sounds absolutely divine to me. The more, the better, I say. I hope you had a roll of paper towels handy, because you must have had a lot of spillage. Maybe all that melted butter is good for your chin and cheeks. Softening anyway. Jaffer: Ah, yes. But that's why you eat it quickly; before it gets too soggy. Don: Agreed. Extra napkins are a must. Especially when you're eating at the laptop. I'll go with "a", Extra-extra buttery popcorn. 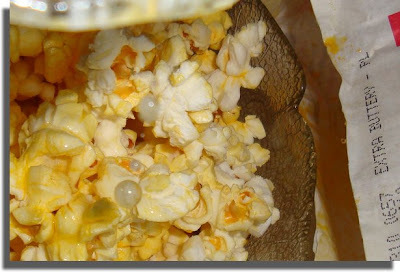 But then if you toss in some more plain popcorn, it goes back to its original mono-extra status. :) Girl after my own heart. Going to create my own butter-butter concoction. I think it makes it: e) GENUINE buttery popcorn! Those artificial flavourings just don't cut it, compared to the real thing, do they? LOL! Chris: Ahhh... So one must layer to keep the Extra-Extra status. I shall need more experimentation, obviously. Ann(ie): Glad to hear I'm not the only one! Enjoy! Vegas Princess: It WAS hard to resist! I succumbed to temptation Extra swiftly. Ah, Jay! You are correct. "E" is definitely another great option. And yes, real beats fake anyday. Not so big on popcorn in the UK. At least I don't think so. The only time I have it is on the very rare occasion I go to the movies. That's about once every two or three years! All I know is that looks AMAZINGLY good! And I'd be sent to the ER stat :)! My Mommie sprays on that butter in a bottle. I do not think it is very delicious that way. I like po'corns, too. I only eat the white parts, not the hard yellow parts. Now you've made me want popcorn. But the kids are still up (I can hear them!) and if they heard or smelled the popcorn, I'd never get them to bed. Babs: I prefer my popcorn salty... Daughter likes it sweet; her favorite is kettle corn. Popcorn with no shucks? Then you'd like Popcorn Twists; it's delish! KarenMeg: Ew, yeah! Sorry I can't offer you any! Ah good for you Daisy! We wouldn't want those darn things to get stuck in your throat! Our cats haven't tried popcorn, but the dog LOVES it. LadyBanana: Exactly! Which is why I need to restrict my consumption to rare occasions. Oh, nom. I love those self-serve butter stations some movie theaters have now. They just make it too easy. yum, yum, yum and YUM!